From classic to contemporary, regional to global, discoveries abound in the Southeast’s art capital. Karen Anne Myers, Geo Stripes, oil on canvas, 60 x 36 inches. Pinkney Herbert, Faucet, 2014, pastel and ink on paper. Colin Fraser, Drift, egg tempera on panel, 24 x 48 inches. As recently as a few years ago, Charleston, S.C.’s rich contemporary art scene was also an overlooked one, with visitors to this tourism-friendly city coming more for the beaches than the galleries. And while the numbers may still be in the beaches’ favor, Charleston is quickly becoming known as a fine art destination. A walk through the historic downtown will take you past countless galleries and fine antique stores—there’s even an art-centric hotel, The Vendue Inn, which opened just last year. Dunn knows the city’s art scene from many angles—she’s a fine art photographer herself, as well as gallery director at Atrium Art Gallery, in the heart of the French Quarter. 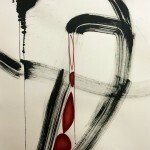 Atrium represents 16 figurative and abstract painters, as well as Dunn, who is their only photographer. “We get a lot of new collectors, lots of people who are buying their first home and looking for art to furnish it with,” Dunn says. “Ninety percent of our clients are from out of town. Charleston’s an art destination.” While Atrium shows works by all of its artists year-round, in March the gallery will feature Maine painter Ruth Hamill. 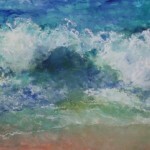 Hamill works in encaustic on canvas, creating moody, dynamic images of the sea. The show’s opening on March 6 will be part of the quarterly French Quarter Art Walks, which happen the first Friday of each March, May, October, and December. While these are always the busiest art walks of the year, many downtown galleries host openings monthly, usually on the first Friday, as well. One of Charleston’s best-known contemporary galleries is Robert Lange Studios (RLS), which is owned by hyperrealist painter Robert Lange and his wife, realist painter Megan Aline. In March, RLS will show the work of Kerry Brooks, a Midwestern-born painter. “Kerry’s really interesting because she fell in love with the classic Russian figurative painters, and she went and studied in Russia for five years,” Lange says. “She came back with this incredible ability to paint the figure in this beautiful, Old World style.” The works that Brooks will show, Lange adds, “are reminiscent of Gustav Klimt’s work — they’re very highly rendered.” Next month, RLS is hosting a highly unusual group show, which has RLS painter Nathan Durfee collaborating with 12 other artists, including street artist Patch Whisky and painters Kevin Taylor and Karen Ann Myers. Durfee, who paints brightly colored narrative works filled with storybook-like characters, first explored collaborative painting with both Lange and Aline a few years ago; he and Aline ended up creating a series of paintings together in 2012, all of which sold almost immediately. Just a couple of blocks from RLS, The Vendue Inn is a boutique hotel that reinvented itself as an art hotel in early 2013. Filled with works by artists from across the country and the world, the inn hosts two shows per year that last six months each. The Vendue hired Lange and Aline to curate their collection, so the couple stays busy there, as well. The inaugural exhibition, “I See a Pattern,” opened in November and will be on view through April. Comprising paintings and sculptures by 40 artists, the show consists of a huge variety of interpretations of the “pattern” theme. One of those interpretations is an interactive sculpture—a full-body sized version of the Pinscreen toy that sits in the hotel’s rooftop bar. If you like your art a little more traditional, Coleman Fine Art on Church Street represents famed Lowcountry watercolorist Mary Whyte. Whyte is known for her portraits, especially of members of the Gullah communities that live on the rural Sea Islands around Charleston and Beaufort. “Right now we’re the exclusive representative of Mary Whyte,” gallery owner Sharon Crawford says. “We have any and all of her paintings that would be available.” As of this year, Coleman is working with only Whyte and no other artists, and they show her work year-round. 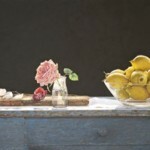 At Ann Long Fine Art this month, visitors can see works by classical realists Kamille Corry and Louise Fenne. 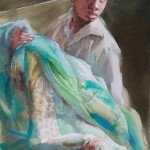 Both women studied painting in Florence, among other locales, and both bring a stillness and clarity to their canvases. Ann Long also carries highly collectible etchings by Elizabeth O’Neill Verner, an early 20th-century artist and teacher who is, according to most, South Carolina’s best-known female artist. Principle Gallery, a 21-year-old business based in Alexandria, Va., opened a Charleston branch a year and half ago. “Charleston is a great art town, one of the country’s top tourist destinations, with interesting architecture, culture, and food,” says director Clint Mansell of the gallery’s decision to open here. “We do mostly contemporary realism—some abstract works, but mostly representational, from hyperrealism to cityscapes, mostly in oil.” Among the gallery’s artists is Colin Fraser, a Glasgow-born still life specialist who paints in egg tempera. In March, Principle will be showing works by Sergio Roffo and Gene Costanza. Helena Fox Fine Art specializes in American representational art and shows the work of 16 contemporary Impressionists, Luminists, Tonalists, and realists. Fox is the exclusive dealer of one of the South’s most prominent representational artists, West Fraser, and also shows sculpture by Kent Ullberg and hand-crafted jewelry by goldsmith Sarah Amos. “Our varied collection offers something to everyone,” says Fox, “and we are dedicated to assisting individuals and institutions in acquiring quality pieces for their collections.” The gallery’s March show features landscapes by Fraser as well as by Joseph McGurl and Donald Demers. It goes without saying that Charleston is a fabulous place to shop for antiques, as well as for art. The city’s extensive network of both antebellum homes and families who have lived in the Lowcountry for hundreds of years means that the local antique shops do a brisk business—even if most of those families would never admit to selling Grandmama’s silver set. A stroll down Lower King Street will take you past several antiques shops carrying European and American items. While excellent items are easy to find at nearly any of them, for a more curated selection visitors should stop by Biggs Powell Interior Design. The shop, which is the Charleston branch of designer Biggs Powell’s Memphis design and antiques store, carries both originals and reproductions of furniture and decorative pieces. And if you want to make a weekend of it, pick up a three-day pass to the Historic Charleston Foundation’s Charleston Antiques Show, which brings in dealers from across the country to add to the strong local market. “It’s truly an international show,” says Fanio King, the manager of events and marketing for the Historic Charleston Foundation. “This year, in addition to our wonderful American dealers, we have three dealers coming from England.” Opening with a preview party on March 19 and running through the 22nd, the show includes educational workshops, soirees, and an auditorium’s worth—the show is held in the large Memminger Auditorium—of antiques from more than 25 dealers. Visitors can count on a large selection of American and European furniture, decorative arts, vintage jewelry, silver, and niche items, like decoys and birdbaths.